The following is a brief explanation of the Siberian bear feast and its relationship to the Lucifer rebellion. The bear feast is a ritual intended to pacify the bear's soul for having been slain by hunters. The ceremony involved with the killing and eating of the bear is first to honor the bear so that the bear will speak good of the hunters on its return to heaven and second, to make sure they do not disrespect the bear so that its angry spirit will not haunt them and cause them harm. The bear feast is very ancient and is one of the most important events in Siberian communal life. A parallel story hidden within the folktale of the Great Bear explains how all of this came about. And that is the story of the Lucifer rebellion which is at least Andite in origin. I was not looking for this nor was I expecting to find this connection in my search for the meaning of a word in Khanty. The Khanty are one of several ethnic groups living in Siberia. It all began with one word: AS-iki. Having already researched Enki and the constellation Pegasus (AS-iku) I thought there may be a connection between AS-iki (Khanty) and AS-iku (Sumerian). There was but not as I had expected. The great square of Pegasus is called AS-iku in Sumerian and is related to Enki. The name AS-iki is Khanty for the protector of the middle world who is also related to Enki. The Ob-Ugrian protector and the Sumerian god Enki (Van) are both associated with a god who watches over the world upon a flying white horse. But lets start at the beginning. I started off by looking for the link AS-iki with the Sumerian AS-iku. In the book Khanty, People of the Taiga: Surviving the 20th Century by Andrew Wiget and Olga Balalaeva are these quotes, "Moreover, in a common Indo-Iranian folkloric turn, the humiliation of the elder brother Great Bear brought about the elevation of the younger brother, the Sky Rider-Goose Hero." "Ugrian belief was dramatically transformed, under continuing pressure from southern Indo-Aryan populations, which spread northward out of the forest-steppe contact zone into territory between the Urals and the Ob and Irtysh rivers perhaps as far as the Konda River. This influence from the Caspian steppe zone probably came in two waves: first Indo-Aryan after about 1500 BC and the Iranian, perhaps a millennium later, following the Scythian and Sarmatian incursions into the steppe zone." The Great Bear was the first son of the sky god and was exiled/evicted from heaven. He defied the supreme god by looking down upon the earth and was enchanted by what he saw. He was lowered to the earth by golden chains. In some myths he also attacked people and destroyed their villages. Another part of this myth is that when the Great Bear is slain, as part of bear-feast ritual, his soul is returned to heaven and there it is resurrected. In the heavens he became the constellation Ursa Major. We can see at least seven points of contact of the Khanty Bear Myth with the legend of Lucifer. Lucifer was the top celestial of the rebellion (represented as the first born), he was thrown down to earth (evicted from heaven), myth has it that he - as one of the celestials - was enamored with the women of earth (enchanted by what he saw), was bound in Tartarus by chains (lowered to earth by chains), in his manifesto claimed resurrection was the natural law of the universe (in the Bear Myth he is resurrected in heaven and becomes Ursa Major, the Big Dipper) and he was that rebellious angel (was a destructive bear). The Great Bear is not Lucifer. He is from an older oral shaman tradition past on by the singing of the bear-songs and the customs of the bear-feast. This Luciferian story of the Celestial Bear is only the underpinnings to the more important hunter-to-bear relationship. It was this Sky Bear who fathers the half-human half-bear, known as the Bear's Son. There is one more point of discussion. The bears in the Ob-Ugrian shamanistic culture are considered as half human. A reflection of the story of the Nephilim and as is the case of the Mesopotamian beliefs, this shamanistic/Nephilim bear is born of a celestial being to a human woman. Not only are bears considered as half human, some believe they themselves are half bear in human form and with the heavenly bear as half human in a bear's form. There is yet another connection to the Mesopotamian story: "There are indications that a similar ursine belief was present among other circumpolar peoples across N. Eurasia (Anisimov, 1963; Lushnikova, 2002; Sokolova, 2000). Moreover, a number of insights can be drawn based on well attested cognitive parallels associated with circumpolar bear ceremonialism. For instance, in the ursine cosmology documented for the Khanty people of western Siberia, the sacred narrative speaks of a celestial Sky Bear ancestor who dwells in the heavens above. It is the son (or daughter) of the Sky Bear who comes down to Earth explicitly to teach humans how to behave, treat each other and nature properly and carry out the necessary "sending home" ceremony performed for the souls of individual earthly bears slain by hunters (Shepard, 2007; Shepard & Sanders, 1992; Schmidt, 1989). So there are now nine points of contact including this sacred narrative with its bestowal of culture from heaven by a Sky Bear. The same is true of the Sumerian beliefs that culture was a gift from heaven by the gods. In one of the Babylonian traditions that would be Oannes the apkallu fish-man another being who is also half animal half human. We could go ten points if we wish to include the story of Van (elevation of the younger brother) who did become the World Watching Man - the titular head of the planet after the default and his intimate association with the Tree of Life/World Tree - that element so prominent in Shamanism. "What is most remarkable to me is the discovery of the staying power, that is, the cognitive resilience of beliefs and social practices attached to the Sky Bear, bear ceremonialism and its associated relational ontology. All across the N. Hemisphere these beliefs have served to bind together humans and bears, landscape and skyscape, utilizing the stars of the Big Dipper and stars nearby to illustrate and hence help insure the transmission of this aspect of the ursine belief system from one generation to the next (Frank, 2014a, 2014b, in press).4 And this is also true of Europe. As we have seen, these conceptual linkages are particularly striking, even today, once we begin to investigate the European ethnographic materials, both past and present. In short, the cosmovision in question has left an indelible mark on the culture of Europeans." One of the unusual side notes to all of this is the UR prefix in ursine and Ursa Major. Ursa Major is the Great Bear and Ursa Minor is the first female bear. See the page The Vanites for more info on the UR prefix. Ursa is Latin from the IE for bear. We, as Urantia Book readers, know an important background relative to this subject and that would be the Andites and their many relationships with Central Asia. One would be language. The term Aryan is an earlier term that as been replaced by Indo-European. Linguists have no clue about Andite history and at present the area known as the Caspian Steppes which is Scythian territory (see map) is considered as the origin for the Indo-European language rather than the highlands of Turkmenistan. "The civilization of Turkestan was constantly being revived and refreshed by the newcomers from Mesopotamia, especially by the later Andite calvary-men. The so-called Aryan mother tongue was in process of formation in the highlands of Turkestan; it was a blend of the Andonic dialect of that region with the language of the Adamsonites and later Andites" (UB 872). Turkmenistan had become a reservoir of Andite occupation and was the dominant culture and thus is Aryan linked to the Andites and Indo-European. "For over twenty-five thousand years, on down to nearly 2000 B.C., the heart of Eurasia was predominantly, though diminishingly, Andite" (UB 878). "For almost fifteen thousand years centers of mixed Andite culture persisted in the basin of the Tarim River in Sinkiang and to the south in the highland regions of Tibet, where the Andites and Andonites had extensively mingled. The Tarim valley was the easternmost outpost of true Andite culture. Here they built their settlements and entered into trade relations with the progressive Chinese to the east and with the Andonites to the north" (UB 878). The northward moving Andites reached Siberia as evidenced by the story of the rebellion woven into the fabric of the bear feast. These are the people, I believe, referred to as Indo-Aryan by Wiget and Balalaeva but with a much deeper time line than current speculation. For more info on the Andites and their origin see the page The First Legend Introduction. Also you may be interested in the DNA results extracted from the Tarim Basin mummies. Wikipedia is a good start. Another Central Asian relationship would be the horse discussed in the next section. As for timing, when did Shamanism, that indigenous religion we know of today that emerged from an earlier spirit belief system which I call Aboriginal Animism appear? It is later than I originally thought. My first time based concept of Shamanism was from the very early Paleolithic based on the initial arrival of the Caligastia 100 and the Tree of Life. But these narratives and rock art speak of a much later time which is about the Bronze Age and is the current estimation. First and most importantly are the Andites whose beginnings are Paleolithic and lets say (since we really do not know exactly the timing of their migrations from Mesopotamia) the Andites are in Central Asia, Iran, India and China by 20,000 BC. At this time Adamson and Ratta had previously lived in the Kopet Dagh for an extended period of time and whose extended family included the first Andite population. These hunter gatherers would have been in Central Asia earlier by perhaps as much as 15,000 years. Adamson and Ratta were gone by now but the Andites from Mesopotamia continued to migrate into Central Asia. The Andites are of an immense importance as it is they who mainly carry the story of the Lucifer rebellion and maybe the Tree of Life but you could debate me on that. I have my own theory as to where Shamanism originated and that would be north of Mongolia and just northeast of the Altai Mountains. That is based on the ethnic group of the Evenki and particularly their southern habitat, the vicinity of Lake Baikal. These are a Tungusic speaking people from whose language the term Shaman comes from. The Evenki word šamān, refers to “a person who knows" along with other different cultural definitions to include "one who is excited, moved, raised", "to heat oneself" and "Holy man.” Shamanism about Lake Baikal is very strong today and a popular tourist spot because of it. In general, migration patterns at this time are westward. If that and what I think is true then the earliest migrations of Shamanism is mainly westward and continuing past western Siberia (Khanty, Mansi and Nentsy) with the northern avenue traveling to Finland which is part of the Finno-Ugric language group with some cultural commonalities with the Khanty including the Great Bear narrative. Those who migrated east would be one of the fore bearers of the Amerindians also called Paleo-Indians and Paleoamericans. These terms are broad enough to cover both of the migrating groups, one who settled North America, the more pure-line of Native Americans and a smaller secondary group (and slightly genetically different) who settled Central and South America. It has been confirmed by DNA analysis that North American and South American native peoples are related (Cambridge University 2014). Eventually Shamanism became world wide. The next reason is the horse, one of the most important animals in this story. Enki, the World Watching Man, rode a flying horse. The horse was domesticated by the Andites (UB 902). The accepted time is 4000 BC, the UB has horse domestication by 5000 BC. The horse helped build empires by pulling chariots and moved armies faster than ever before. The war horse was a supreme animal and the Andites used it to conquer the blue man in Europe. On many a Shaman's drum the horse is tethered to the World Tree. So the horse on the drum becomes a tangible marker of time. "Horses sacrifices and divininization with bones was practiced. Horses are still sacrifice today. Their dried corpses are hung from long sticks in the Altai Mountain region of Mongolia. This ritual is performed because it is believed that only a sacrificed horse can carry the shaman to heaven." The oldest description of the shaman's drum is from 1170 AD which is recent on this time line. The Bronze Age in the Near East starts at about 3300 BC. Historians have the Sumerians at about 4000 BC. To date the oldest known shaman burial is at 10,000 BC in Israel from the Natufian culture. This burial, which would be before the rise of Mesopotamia, could be Proto-Shamanistic or even the more organized and hierarchal Shamanism that eventually surfaced worldwide. This woman could be a shaman replete with a tradition that included knowledge of the Lucifer rebellion because since she is Natufian she is also Andite. See the page The First Legend Introduction for more info. Another support for Shamanism being over 10,000 years old is the evidence of early migrations from eastern Siberia. These tribes that crossed into the northern Americas carried some form of Shamanism with it. Even though we are at a date more than twice to three times as old as the accepted Bronze Age dates it is possible a Proto-Shamanism arose much earlier than assumed. The dating of rock painting and petroglyphs does not necessarily date the beginning of Shamanism or its belief system - that of gods or not. The most compelling evidence for the 10,000 Siberian early date is the "Mal'ta Boy" a 24,000 year old skeleton from the region of Lake Baikal. His DNA revealed this: "Another significant result of the study is that the Mal'ta boy's people were also ancestors of Native Americans, explaining why some early Native American skeletons such as Kennewick Man were interpreted to have some European traits. 'Our study proves that Native Americans ancestors migrated to the Americas from Siberia and not directly from Europe as some have recently suggested,' Graf explains." (http://donsmaps.com/malta.html) The prevailing theory is for 16,500 years ago (https://www.nps.gov/bela/learn/historyculture/other-migration-theories.htm). (Some archaeologists have 13,500 as the first migration which would be Clovis but that date now is obviously too late.) Now the latest suggestion (Nov 2017) is 20,000 years ago which still fits with the DNA from Siberia, which at this time I would think would be for Proto-Shamanism. This date is based on this: "A California rock art site has been dated to about 20,000 years ago, based on analysis of mineral varnish covering a pictograph (Bower 96a)." (http://www.jqjacobs.net/rock_art/dawn.html) I do not believe the earlier aboriginal animism which is pre-Andite (and has to be before 25,000 years ago for the first Mesopotamian migrations and 35,000 years ago for the Adamic migrations) had the framework of gods coming down from heaven, probably no gods at all, but rather was more vested in local spirits, places of spiritual power and an environment of spirit infused plants, trees, rocks and natural forces such as the wind and rain. Some of the native Inuit today have shamans and yet have no gods to worship. But over time and the absorption of Andite beliefs Shamanism as we know it emerged. 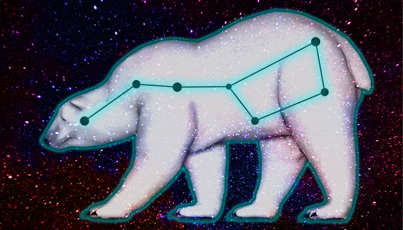 Along with DNA and Shamanism the legend of the Great Bear also crossed over: "The Algonquins of North America interpreted the four stars of the quadrangle of Ursa Major as a cosmic bear. Bear ceremonialism involving veneration of bears, as well their ritual sacrifice, was practiced across the northern hemisphere by the Basques, the Sami people of Scandinavia, the Siberians as well as tribes of North America. Bears were revered by all of these peoples as ancestors of humans and messengers between mankind and the gods." 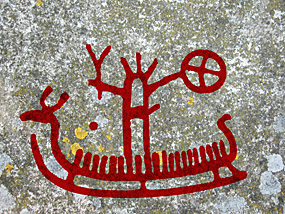 (https://treeofvisions.wordpress.com/2015/05/09/the-global-spread-of-shamanism/) In the end though, we cannot say if that level of Shamanism depicted by rock art crossed over from Siberia to the Americas at that early age but it is possible. I do think we can support the theory that at least some form of Proto-Shamanism did cross at that time. Mal'ta Boy: As stated above Native Americans have both Siberian DNA, up to 25%, and early western European DNA. What today's anthropologists believe is that Europeans had contact with the people of the Mal'ta boy. "The genome of a young boy buried at Mal’ta near Lake Baikal in eastern Siberia some 24,000 years ago has turned out to hold two surprises for anthropologists. The first is that the boy’s DNA matches that of Western Europeans, showing that during the last Ice Age people from Europe had reached farther east across Eurasia than previously supposed. Though none of the Mal’ta boy’s skin or hair survives, his genes suggest he would have had brown hair, brown eyes and freckled skin. The second surprise is that his DNA also matches a large proportion — about 25 percent — of the DNA of living Native Americans. The first people to arrive in the Americas have long been assumed to have descended from Siberian populations related to East Asians. It now seems that they may be a mixture between the Western Europeans who had reached Siberia and an East Asian population." "The other surprise from the Mal’ta boy’s genome was that it matched to both Europeans and Native Americans but not to East Asians." (http://www.nytimes.com/2013/11/21/science/two-surprises-in-dna-of-boy-found-buried-in-siberia.html) Empirically it is a reasonable conclusion that the finding of western European DNA meant that it traveled eastward. But it is not the case. The "European" DNA could be Andonic or more likely Sangik (blue man), archaic Homo sapiens, those first settlers of Europe. The population flow is westward not eastward for the main flow of Andite and Adamic bloodlines. Even at the height of the Great Ice Age the corridor between the Urals and the Caspian Sea remained open. So, of course, you should expect a "European" DNA to show up. Also within the grave were found some venus figurines. So far a group of some 30 have been recovered from this area. As concerning the venus figures (the great mother) that is Andite influence. We also know Andonites were mother worshippers. The UB states that there were andonites living north of Turkmenistan. What you may not know is that Siberia east of the Urals, of all places, was not covered by glaciers. Look at any glacial map if you do not believe me. These figurines found in the grave of a three to four year old boy I believe confirms what I have stated earlier on my page The Venus Cult. That is these figures are sacred images and are primarily religious in nature. They are not fertility objects. What would a fertility object be doing in the grave of a three to four year old boy? What would a religious artifact being doing in that same grave? The last quote about no East Asian, Chinese population, found in the DNA is really no surprise. What anthropologists do not know is about that terrible war between the red man and the yellow man and the result of the continuing warfare finally drove the red man into North America. 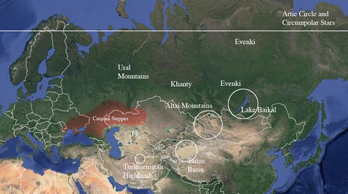 More information can be found at http://cof.quantumfuturegroup.org/events/5402 with a paper titled Event #5402: Mal'ta-Buret' culture west of Lake Baikal similar to coeval cultures of Western and Eastern Europe. Finland also plays a part in trying to determine when Shamanism became the indigenous religion. research (for reviews of this research, see, e.g., Lewis-Williams 2001; Whitley 2006: 109-22). As presented by David Lewis-Williams and Thomas Dowson in their 1988 article titled The Signs of All Times: Entoptic Phenomena in Upper Palaeolithic Art, the ‘neuropsychological model’ is based on the undeniable fact that all anatomically modern humans share the same nervous system (Lewis-Williams & Dowson 1988: 202). We experience the world in a fundamentally similar way, and even our dreams and hallucinations are similar. Neuropsychological research on human cognition is thus cross-culturally applicable and forms a kind of ‘bridge’ to prehistory. The visions and sensations experienced by a 21st century European in trance are fundamentally similar to those experienced by the rock painters 6000 years ago." "Shore displacement studies are the single most important means of dating Finnish rock art. As this method is not necessarily familiar to non-Nordic scholars, a brief explanation is warranted. During the Late Pleistocene, nearly all of Fennoscandia was covered by an ice sheet as much as three kilometres thick, the weight of which pressed down the earth’s crust. When the Ice Age ended and the Fennoscandian landmass became ice-free, it began to slowly rise again – a phenomenon known as isostatic land uplift. The speed of the uplift is highest (ca. 8 mm/a) near the ancient epicenter of the ice-sheet (the modern Gulf of Bothnia) and slows down towards the edges of the ice-sheet. When the rate of land uplift is known, it is possible to calculate the approximate date when an archaeological site originally located on the shore – but today found inland – would have been in use. In sum, studies published in the 1970’s suggested that the period of rock art began around 3000 BC and lasted until about AD 500. "It should, however, be noted that pottery was not the only innovation reaching Finland at this point. Early Comb Ware sites sometimes also feature clay idols (Núñez 1986), another feature usually associated with Neolithic cultures that probably spread to Finland from the east. Given these eastern contacts, it is possible that the practice of creating rock paintings also spread to Finland from the east. Although rock paintings have not been found in most of European Russia, the cave paintings of the Urals, which have recently been radiocarbon-dated to the Late Mesolithic (ca. 6000 calBC; Steelman et al. 2002), provide evidence of an early rock painting tradition in that area. Although geographically far from Finland, discoveries in Finland of Subneolithic sled runners and other wooden objects made of Siberian Pine (Pinuscembra s. sibirica), a tree that only grows east of the Urals, provides striking evidence of long-distance contacts and travel even in this early phase of prehistory (Edgren 1993: 67)." "Unlike Sarvas, Siikala attempted to interpret all the images of rock art – not just some categories such as elk. Siikala saw all the paintings in a shamanistic light. For example, anthropomorphic images represent, in her view, human-shaped spirit helpers, as do the images of birds and fish. Boat figures, on the other hand, were related to the passage to the Otherworld in a boat or canoe. Siikala also found a parallel to the handprints of rock art in the metal decorations of the shaman’s costume, which sometimes include metal plates cut in the shape of a human hand (Siikala 1981:92). "Yet the question of how the horned anthropomorphs should be interpreted is more complex than it may appear. It is not even clear that the two strokes in fact represent horns – they might, for example, represent feathers, hair or some sort of ‘rays’ of energy projecting from the head. The last suggestion is not as strange as it may seem. In the rock paintings of the Canadian Shield, where some traditional knowledge of the meaning of rock art has survived, similar ‘horns’ painted on human figures represent exactly that – a sort of supernatural wisdom and potency emanating from those shamans who were thought to be exceptionally powerful (Rajnovich 1994: 92-97). These paintings are, of course, geographically located very far away from Finland (even if they arguably belong to the same ‘circumpolar rock art belt’, cf. section 2.1), and the analogy is thus of inspirational value only. But it is interesting to find that, as Autio (1995: 13) himself points out, on Saami shaman drums the representations of divinities or other particularly powerful anthropomorphic beings do often have two or more ‘horns’ on their heads, perhaps symbolic of their exceptional power. "In many cultures, the shaman in his trance passes through the rock into the spirit world, and to communicate what had happened in the trance, the shaman depicts what had happened on the other side on the rock… In addition, several contemporary shamans have acknowledged that the rock art is a marker for where a shaman could enter the rock." "Detailed verbal descriptions of shamans' ASC experiences then often recount the opening of the rock face or an entry though a crack, into the supernatural beyond, as the first event of a shaman's trance." ASC stands for Altered States of Consciousness. I would agree with boats being a shamanistic vehicle. Not only that but most rock art is shamanistic. Shamans fly through the sky during the trance, Enki as the World Watching Man flies on a winged horse and Enki as the Sumerian god flies/sails on his Boat of Heaven. Another part about boats is that they are also the funerary vehicle for the dead which is a very wide spread belief among ancient peoples. These boats took the soul by river to its destination. The Greeks had their River Styx, the Egyptians had their River of the Dead, ancient Japanese had their River Sanzu and the Sumerian Gilgamesh in his quest for immortality had to cross the Waters of Death. In fact just about all ancient cultures used water as a portal to the land of the dead. This petroglyph is my interpretation of the shaman's boat. It has the traditional boat with the shaman, drum in hand, standing on the deck. There are similar images of shaman on boats and images of shaman with the cross in circle drum in hand. I put these two ideas together. The accepted idea of the cross in circle motif with boats is that they are sun disks. I have come to a different conclusion. After studying these iconic images of the cross in the circle they show up in a variety of ways but most likely not as sun disks. They are not sun representations but rather they are the axis mundi, which can represent a numbers of things, and in this context they represent water, the four rivers that flow to the encircling sea, an idea which is very well older than Sumerian and whose world concept of this sea extended to the time of Medieval map making. Since water is one of the entrances to the otherworld and given all the associations of the shaman, boats, axis mundi, world tree, trance and souls I would say this explanation is as good if not better than the status quo. Some images have the disk attached to the boat which would seem out of place for the sun. (Is it hot in here or is it just me?) Some disks are incorporated into human-like figures which are most likely shaman. It would, however, make perfect sense if it is the axis mundi with all the symbolism attached to it. It has much deeper mystical connections instead of being just a sun disk. And the axis mundi is directly connected to heaven and the underworld. "Prevalent among the descriptions given of shamanic journeys is that of a tunnel or tube to which the shaman is transported. The tunnel sometimes appears ribbed and may bend or spiral around. This tunnel-like imagery is associated with the central axis that unites the three inner planes of consciousness. The shaman is conveyed up or down the tunnel to an exit that opens out upon mystical worlds. In these worlds, the shaman experiences sensations and communications that go beyond the usual senses. Conversing with plants, animals, and the guiding forces of nature becomes possible. The shaman accesses knowledge, power, and healing. Upon finishing the explorations, he or she returns via the tunnel to ordinary reality. It is interesting to note that such tunnel imagery is prevalent among descriptions given of the near-death experience." Clearly the axis mundi concept of the Shamans predate the Mesopotamian. It may even predate the advent of Shamanism. That means it could be a part of aboriginal animism. Certainly could be a part of Proto-Shamanism, that time frame for the coalescence of the various disciplines of the shaman to include knowledge of medicinal herbs, divination, intercessor with spirits and general caretaker of the clan. How far back is anybody's guess but the Lower Paleolithic is a good place to start. 'Of course, we must understand that interpretation of these images is not easy,' he said. 'Central in the composition are the anthropomorphic images. 'It is difficult to say definitely who they represent: the hunters or spirits? In particular, there is a figurine, close to which is depicted a circle - a solar sign, the sign of the sun. It has a cross inside. In many local cultures it may represent shaman drums. The rock art we have been discussing is shamanistic and most likely Bronze Age. The art from the Urals is a bit older and could be pre-Bronze Age. But that is quibbling when compared to the earliest dates for cave paintings and petroglyphs. "Two years ago, Diez and a team of archaeologists discovered that the smudge – a red disc painted in a corridor known as the “Panel of Hands” – was much older than previously realised. In a 2012 study published in the journal Science, they revealed that the painting was at least 40,800 years old – making it the earliest-known cave painting on Earth. "Diez and his colleagues argued that the painting was so old, in fact, that it might predate modern man’s arrival in this part of the world, and thus may actually be the work of a Neanderthal. With more research, Diez thinks they will soon discover even older paintings. "To go back further, into the age of Neanderthals, Diez and his colleagues borrowed a technique from military science for dating the radioactive uranium that appears in calcite. They tested formations of the mineral that had grown atop paintings in 11 caves, assuming that whatever its age, the underlying paint had to be at least as old, and possibly much older. (The method proved so successful that other researchers used it to make another major discovery in October 2014: a 39,900-year-old handprint in Indonesia that is now considered the world’s second-oldest painting.)" In the quote above both modern man and Neanderthals have been discussed in relation to the oldest artwork. So where is AMH, the Anatomically Modern Humans, in this discussion (artwork that might "predate modern man's arrival")? Conveniently forgotten. They, after all, had been around for 200,000 years. True, Neanderthals were involved with red ochre, they even processed it. But Neanderthals were not alone, even Homo erectus pounded red ochre into a powder. Let's not forget Homo heidelbergensis who also lived in Spain and was contemporaneous with Neanderthal. This species also used red ochre. Since that's the case AMH could have just as easily painted the caves of Castillo. Neanderthal could have done it as Spain was their last stronghold but I just don't think Neanderthals did the painting. The art work may be just a simple round disk but it still smacks of a level of conceptual thinking, such as spiritual, otherworldness and abstract expressionism that I do not believe were in Neanderthal's play book. If Neanderthal did do the paintings I would not ascribe any advanced conceptualization to it. AMH were, on the other hand, on that cusp of becoming Homo sapiens sapiens- modern man and in this context considered as Cro-Magnon. "Bednarik writes that a most interesting aspect of Paleolithic is its uniformity throughout the world. Despite differences in tools, due to environmental differences, cultural behavior was surprisingly consistent, in his view. He cites as evidence the use of ochre and the repertoire of geometric markings, perhaps an indication of a universal artistic language among archaic Homo sapiens." (http://www.jqjacobs.net/rock_art/dawn.html) This statement supports my contention that Paleolithic artwork was practiced by AMH but Bednarik believes it goes deeper than that to include archaic Homo sapiens, the Sangiks, and that they had some sort of visual language which would include dots (along with other geometrics such as lines, crosshatching, triangles, circles and such). The Anatomically Modern Humans shared some of the caves with the Neanderthals (and perhaps archaic Homo sapiens did too) but usually not at the same time. So dating alone by Diez of that painted dot does not prove or even indicate that it was made by a Neanderthal. Bednarik, as mentioned above, elsewhere is quoted about his understanding of an even older form of rock art - the cupule - (a term he invented and pronounced: kyo͞opyo͞ol) that hemispherical dot-like indentation of rock surfaces found around the world such as in the "cup and ring" tradition. The oldest known cupule dates at the minimum to 290,000 years ago and may reach 700,000 years ago. That's not AMH, that's archaic Homo sapiens, and reaching to include Homo erectus, and this cupule is found in central India. 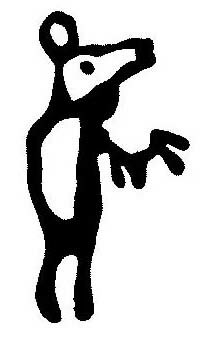 The cupule is the simplest form of the petroglyph. A more advanced form of rock art found in Australia has been dated to 60,000 years ago which is AMH. "Also, according to Bednarik, due to Homo erectus' success at crossing the open sea to colonize islands - a facility dated to 830,000 BCE - he "clearly had language". And since language is a system of symbols, such an attribute is quite consistent with the creation of petroglyphic symbols in the form of cupules during the same period." (http://www.visual-arts-cork.com/prehistoric/cupules.htm) I don't know about you but I have a hard time comprehending what these very early humans were thinking by producing abstract symbolism that could be around 700,000 years old. Bednarik's remarks about a visual language reminded me of something I had run across earlier and that was that there are only 32 signs, all geometric except perhaps for the hand print, used in cave art across Europe within a 30,000 year period. You can see more on a YouTube video at: https://www.youtube.com/watch?v=aSF4zk2nsTU and https://www.youtube.com/watch?v=hJnEQCMA5Sg. That would indicate that there was a visual/symbolic language commonly understood across vast distances at that early time. Cave art both as petroglyphs and paintings are either representational art such as various animals or it is symbolic. Between the two it is geometrical symbolism that is more frequent. And that is surprising because not too much attention is given to this fact. So, if you were to stand before a decorated cave wall the abstract symbols would outnumber the animal and human images. Now that really is something to think about. If you need refreshment or clarification about the dating of Homo erectus, archaic Homo sapiens, AMH and Homo sapiens sapiens all of which can be confusing see page The First Legend Introduction. The most current theories about Neanderthals are pushing their intelligence almost to be on par with modern humans. There seems to be a movement to make Neanderthals seem closer to us and to avoid any mention that we might have killed them off. Rather reduction of their population through isolation and absorption is what is believed today by main stream scientists to be the cause of the demise of the Neanderthals. I am not swayed by their arguments. Neanderthals were not stupid, they did survive for at least 500K years or more during the brutal ice ages. But they were not that smart or creative. Two points I would concede to the Neanderthals are first the use of red ochre which had to indicate some type of symbolic thinking but we don't know what and second is the fact that they did bury their dead (but so did Homo heidelbergensis). As for tool making, once they could produce flake tools consistently, knaping technique changed little over 300,000 to 500,000 years. Some estimates go back 700,000 years (the UB has it at 800,000 for their origin). Contrast that with modern humans whose knaping technique was immediately superior and progressive. Change came about 35,000 years ago, the same time modern humans came into contact with Neanderthal. This would include personal decoration, jewelry, which had not existed before. This is the time known as the "Upper Paleolithic Revolution" a term created by the archaeologist Ofer Bar-Yosef. At this point everything was changing both for modern man and the Neanderthals. One term for the above Great Bear narrative is skylore, which I like, and describes the relationship of a cosmological model to the cultural beliefs of a given people. It is a blend of legend, religion, and symbolism. As we sort out the meanings and see their interrelatedness we begin to understand the ancient world view chanted in song and painted on rock. The skylore of the Great Bear is important not only for understanding the ritualism within Khanty society but serves as one of those markers like the horse on the shaman's drum. It gives us at least a reasonable point in time although somewhat rough but still something we can work with. Skylore such as the legend of the Lucifer rebellion (or even creation myths) is not part of rock art images. In the case of the Khanty it is a cultural adaptation. The rock art images are directly related to the experiences of the trance and the connection to the spirits. That is one of the functions of rock art. It may have elements, visual hints, of the trance to help the Shaman remember specifics but not a narrative thereof. Another, for example, is to mark a spiritual location not only for the local Shaman but for others who sometimes travel distances to enter the portal at that particular destination. One very important point not really discussed is the use of psychotropic drugs to induce hallucinations and trance. In Siberia Amanita muscaria, which is a mushroom, seems to be the drug of choice. Shaman around the world use a variety of psychoactive chemicals to induce the trance but despite their use of different plants the resulting entoptic phenomena is the same. This is the glue that holds it all together and why the core of Shamanism persists world wide. That is, shared trance experiences equates with shared beliefs. But we still don't know when these potent pharmaceuticals were first incorporated into early man's religion. To recap the most salient points, first we have the skylore of the Siberian Sky Bear that has the parallel story of the Lucifer rebellion within it. That lead to a discussion of Shamanism and its connection to the axis mundi. Both skylore and Shamanism have some type of involvement with the Andites and Mesopotamian beliefs. Then there is the use of drugs for the altered states of consciousness. Neuropsychological data points to us as being hardwired for similar images and trance experiences of the Shaman and that those experiences are similar no matter what the psychoactive agent happens to be. The discussion of Shamanic rock art included its dating which brought up the topics of how old and what is it really trying to tell us both with representational and abstract geometric symbolism (hunting magic? language?). Finally we have the Neanderthals who probably are not involved with any of this but have been dragged into this discussion by archaeologists and paleoanthropologists who think differently on this subject. I didn't think it would become this involved by searching for the meaning of just one word. Then again I should know better. This isn't the first time. There is now beginning a rush to save these narratives from extinction as the ethnic groups holding these beliefs dwindle and are absorbed into a greater and more modern community. Much has been lost or modified through the earlier Soviet persecutions of the Shamans along with a number of earlier ethnic warrior incursions. Hopefully we can fully document the Shaman's world and all its wondrous variations before its too late.